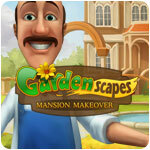 Gardenscapes: Mansion Makeover Game - Download and Play Free Version! Ever since inheriting your grandfather’s estate, both you and your loyal butler, Austin, have worked hard to make the grounds look attractive. The garden is positively divine, filled with lovely flowers, a scenic pond, beautiful swans, and so on! As you’ve started to settle down, you suddenly receive an influx of letters from friends and relatives who want to see your new property. There’s just one little problem; despite all of the work you and Austin put into making the garden presentable, the two of you have completely forgotten about sprucing up the interior of the house! Looks like you’re both going to have to fix the place up real quick. Sadly, funds are short. If you want the place to look squeaky-clean in time, you’re going to have to hold a rummage sale of all the various things you won’t need anymore. Better get cracking; this house isn’t going to clean itself! It seems that your grandfather was quite the packrat. You might not need his stuff anymore, but it’s surprising how many other people do. There is a lot of good money to be had by hawking all of the clutter, but it’ll take patience and a sharp set of eyes to find everything. Locate all the items requested by your customers. Get a higher payout by fulfilling their orders in record time. Find old coins here and there to earn a little extra cash on the side. 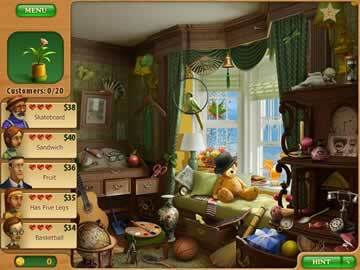 Abstain from using hints and complete each hidden object sequence quickly to earn even more money. 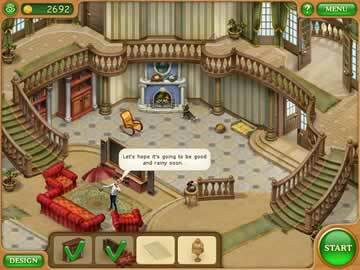 Cleaning up the mansion and satisfying your customers will be easier said than done. Thankfully, your job can be made much easier through a myriad of ways. Get hints by finding question marks hidden throughout the rooms. See exactly where the objects are by clicking on hidden cameras. Find the thermometer to receive “hot” and “cold” clues for the items’ locations. Play on two different levels of difficulty. Play at your own pace with Relaxed mode, or accept a timed challenge with Against the Clock mode. Getting rid of the clutter is only half the game. The other half comes from replacing it all with newer and shinier furnishings. Furnish your home with an assortment of objects, including sofas, chairs, bookshelves, a fireplace, television set, dog mat and more! Choose between at least three different versions of every item. Create your own unique-looking mansion. Click on your furnishings to watch Austin interact with them. If you’re in the mood to play a challenging set of hidden object games that take place on over dozens of different screens and which involve finding hundreds of items, then go no further than Gardenscapes: Mansion Makeover. It’s got it all and a whole lot more to let you get the creative juices flowing.